I wasn’t so sure about all this blog stuff, but have certainly enjoyed others fibery or artistic ramblings. So when I went to this site to see how hard it is for a technologically challenged person to create a blog; I accidentally made one. Guess that means it is pretty easy. So now darned if I’m not going to make it pretty and maybe even enjoy sharing what a group of 6 women are doing in our shared studio space. Our space is my former yarn shop, and my business has changed from a retail yarn focus to creating and learning all I can about weaving and creating hand dyed and handspun yarns. While I do still sell weaving supplies, and our finished products, our focus is on creating; so much so we often forget to turn the open sign out. 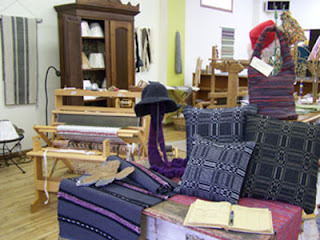 This has always been a good space, whether filled with yarns or now filled with our 7 looms. Three large Glimakra looms, two Schact looms , one Harrisville loom and one formally pepto bismol pink antique loom that belongs to Jan. The hands of many weavers seem to speak to me of all the rugs this old loom has produced over it’s many years, it certainly has the most character of all our looms. The top photo is a shot of our studio during last falls studio sale. Barb Monroe’s lovely Monks Belt pillows were on display and I am sure are now gracing her couch. our studio. And I should have some pictures to post if my daughter brings the camera home from prom tonight.